Victor Gummerson was born in Dodworth, Barnsley in late 1896, the sixth child and youngest son of George Gummerson and his wife Mary Ellen (nee Riley) who married at St John the Baptist Church, Dodworth on the 26th December 1881. The couple had eight children, five girls and three boys, all born between 1883 and 1903. Victor was baptised at Dodworth St John’s on the 4th October 1896. George Gummerson, a coal miner, lived in Clayton West, near Wakefield in 1901, before moving to Ossett by 1911, where he and Mary Ellen and four of their children, including Victor, lived at a three-roomed home at 12, South Terrace, South Parade, Ossett. Aged 14, Victor Gummerson worked as a trammer at the local pit, most probably Roundwood. At some stage the Gummerson family subsequently moved to Woodbine Street, Ossett. Victor Gummerson's army service record has not survived, but it is known that he enlisted in Ossett and later embarked for France on the 15th August 1915 where, like many other Ossett men, he was with the 1st/4th Battalion of the King's Own Yorkshire Light Infantry. The 1st/4th Battalion of KOYLI was formed in August 1914 at Wakefield and was part of the 3rd West Riding Brigade, West Riding Division. They moved on mobilisation to Doncaster and then in November 1914 to Gainsborough. The battalion moved again to York in February 1915 for training and on the 12th April 1915, they landed at Boulogne. On the 15th May 1915 the formation became 148th Brigade, 49th (West Riding) Division. From the "1/4 Battalion, KOYLI War Diary - Ypres-Boesinghe Front - October 1915"
10.10.15: Situation fairly quiet. Parapet of D.21 was blown in at several places. Three red rockets were sent up from German trenches at intervals of about 10 minutes between 6 p.m. and 7 p.m. A searchlight from High Redoubt Fort was turned on to D.20. A machine gun which appeared to be on a trolley opened fire on a barricade. 11.10.15: Enemy fired 50 H.E. shells, which burst in front of our support line and fell in the trench. A German balloon was up the whole period of the shelling and was lowered after the last shell had burst. Little damage done to trench. Casualties Two other ranks killed (including Private Victor Gummerson) and one other rank wounded. 12.10.15: Lt. J.H. Bates took out a strong patrol in front of D.21 to mounds which were thought to be old dug-outs. They made a successful reconnaissance and reported them to be an old S-shaped trench containing 8 dead French soldiers in full marching order and many others were lying round about. They also reported enemy's trip wires were laid to within 60 yards of our parapet. 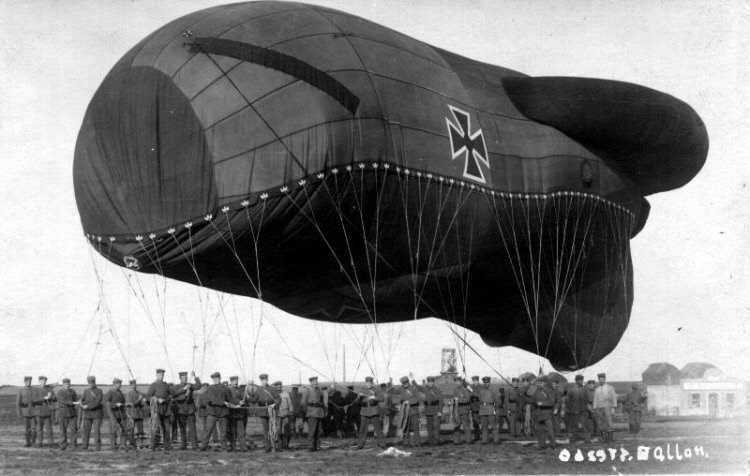 Above: A German WW1 observation balloon being prepared for flight. These were used by both sides and were used to help direct accurate artillery fire on the enemy trenches. Victor Gummerson was posthumously awarded the British, Victory and the 1914/15 Star medals. Private Victor Gummerson was killed in action on the 11th October 1915, aged 19 years, the son of George and Mary Ellen Gummerson, of Woodbine Street, Ossett. He is buried at grave reference II. B. 18. at the New Irish Farm Cemetery,1 Ieper, West-Vlaanderen, Belgium. The cemetery is located to the north-east of the town of Ieper. St. Jean Churchyard, containing the graves of 44 soldiers from the United Kingdom who fell in May-December, 1915. There are now 4,715 commonwealth servicemen of the First World War buried or commemorated in this cemetery. 3,267 of the burials are unidentified, but special memorials commemorate four casualties known or believed to be buried among them. Other special memorials record the names of 30 casualties buried in four of the cemeteries removed to New Irish Farm whose graves were destroyed by shell fire.